AUBURN, Ala. – This summer, 19 Auburn University incoming freshman participated in Pre-Freshman Programs in Belize and Canada. The Pre-Freshman Programs, provided by the Office of the Provost, offer students the opportunity to travel internationally for a week-long cultural experience while earning two university course credits, all before their freshman fall semester. The 2018 Pre-Freshman Program in Belize was led by Assistant Professor in Forestry and Wildlife Sciences Wayde Morse and Auburn Abroad staff. The group of 10 students spent one week living and learning in an intercultural setting while meeting new friends and exploring the historical and modern sustainability issues through examples in Old Belize, Mayan Ruins, the Belize Zoo, San Ignacio and San Pedro. 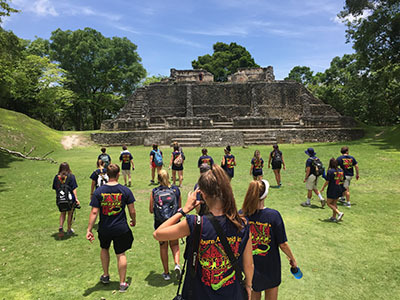 The program offered sustainability lectures, learning about the environment, past and current cultures, and Mayan ruins. It also explored the ways in which two nations, the United States and Belize, handle important sustainability issues in the use of their natural resources. In addition to expanding students’ knowledge of sustainability in Belize through course curriculum, the program also offered first-hand Belizean cultural experiences. The group attended a hands-on chocolate- and coffee-making lesson and visited a Belize Zoo that houses native rescue animals. The group also had the extraordinary opportunity to climb the Mayan ruins and snorkel with sting rays and nurse sharks. Together, the lessons learned through lectures and the authentic cultural activities gave students a comprehensive study abroad experience. “I had a phenomenal experience on my pre-freshman program because amidst the exciting, adventurous tourist and off-the beaten-path activities, we had the opportunity to learn about the economy, society and ecosystem of Belize and were able to relate the knowledge we gained back to sustainability and ecotourism,” said Hannah Eubanks, Belize Pre-Freshman Program participant. 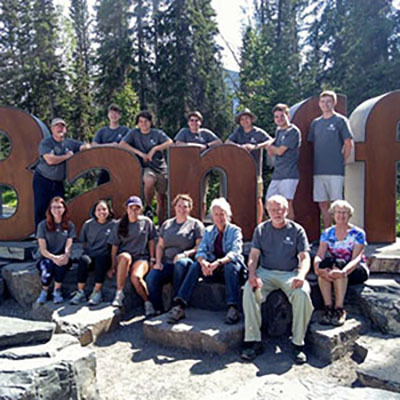 The 2018 Pre-Freshman Program in Calgary, Canada was led by Andrew Gillespie, Distinguished Visiting Professor Douglas Coutts and Auburn Abroad staff. The program provided nine incoming Auburn freshman the opportunity to meet new friends and explore Banff National Park while earning two credit hours in a course titled “The Context of Sustainability - National, Municipal and Community Choices in Renewable Energy and Resources.” The course examined historical and contemporary sustainability and energy issues in the context of Calgary, Canada through differing cultures, environments and trading issues. There were several guest lectures including a land-use discussion from Manager of Kananaskis Emergency Services Jordie Fraser and a presentation on park accessibility from Senior Fellow and Manager for Canadian Parks Collective for Innovation and Leadership Don Den Hoed. “The Alberta Park’s Push to Open program struck me because of its modern and empathetic approach to accessibility and inclusion for people who may be physically handicapped,” said Karson Stebbing, Canada Pre-Freshman Program participant. To supplement the course curriculum and provide students with a full western cultural experience, the group attended the Calgary Stampede rodeo show and embarked on an overnight horseback riding adventure through Banff National Park. They also visited Stoney Nakora First Nation, Buffalo Nations Luxton Museum and the Whyte Museum. Each experience offered first-hand insights to the culture and environment of the beautiful region. The Pre-Freshman Programs are open to all incoming Auburn freshman. A formal invitation to join the 2019 programs will be sent to accepted freshman students at the beginning of the spring semester. Summer 2019 programs will take place in Vancouver Island, Canada and Belize. Students interested in learning more about study abroad and applying for an Auburn Abroad program can visit www.auburn.edu/studyabroad.